At American Pacific Mortgage, we proudly take ownership of the communities where we and our customers live, work, and serve. We talk about how important the concept of ownership is, but we know that it’s not what you say, but what you do that is important. We serve, because we love our communities. The same core values that drive our actions and presence in the mortgage industry also drive us outside of the office. These values - respect for the people in our communities, transparency in responsible communication to earn our customer’s trust, and being scrappy in our unwavering strength of character - are always present. The APMCares Foundation was founded to advance the company’s social responsibility initiative by organizing and providing the means for our employees and partners to serve our communities through financial and time donations. Our mission is to serve the needs of individuals, families, and communities where we live and work. Encouraging and inspiring our core belief that people matter. 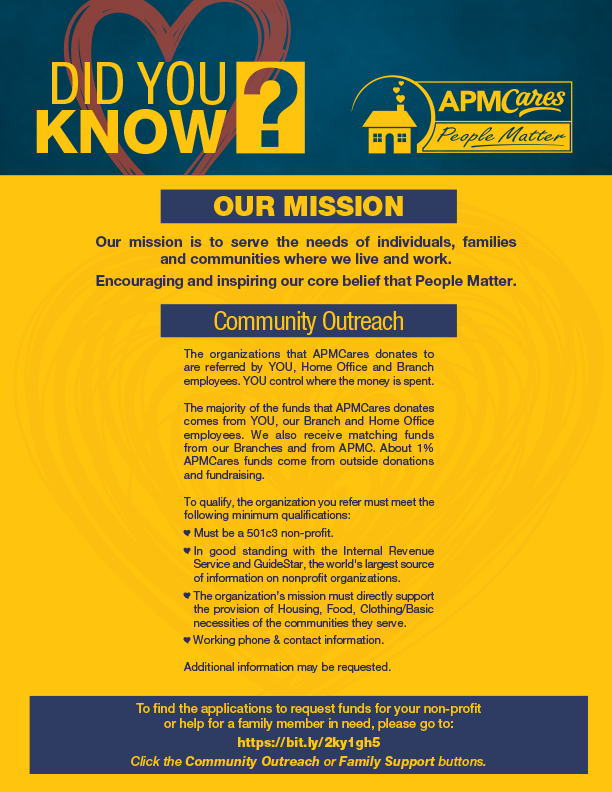 APMCares at work in our communities! The Scotch’s mission is to create awareness and raise funds to help save lives of Veterans suffering from Post Traumatic Stress. CURRENTLY THE SCOTCH PROCEEDS GO TO SAVE A WARRIOR™ ORGANIZATION. Save A Warrior TM has changed countless lives through their “War Detox” program, which supports the healing from Post Traumatic Stress. They specialize in connecting Active Duty Military, Returning Veterans and First Responders experiencing psychological trauma. The mission of Habitat for Humanity Inland Valley, is to facilitate the dream of homeownership, as well as improve living conditions for those in the community. New Phoebe provides housing, services, treatment, and support to Pierce County mothers and children impacted by chemical dependence, and to help them achieve and maintain reunification through healing, self-sufficiency, and clean & sober living. Soroptimist is a global volunteer organization that improves the lives of women and girls through programs leading to social and economic empowerment. The YMCA is a cause-driven organization focused on three key areas: youth development, healthy living and social responsibility. They believe a strong community can only be achieved when we invest in our kids, our health, and our neighbors. Lilliput serves children in foster care & families by bridging the gap between the public & private sectors. Their programs & initiatives provide a strong foundation for children & their families, & ensure that children who enter the foster care system are placed with lifelong families as quickly as possible. The Santa Clarita Coalition mission is to work together as “second responders,” to provide supplemental humanitarian relief to people in areas who need help to rebuild their lives after suffering loss due to a natural disaster, community-wide emergency, or other crisis situation in the Santa Clarita Valley, and, when appropriate, elsewhere in California and the United States.